Did you know you can make fluffy pancakes with collagen?! I discovered this somewhat by accident when experimenting with this Cinnamon Protein Pancake recipe and I love how they turned out! E meals often get a bad rap because some people don’t think they keep you feeling full for very long. Admittedly, it’s trickier to find a variety of lean protein sources to keep you satisfied in an E meal than in an S meal where both lean and fatty protein sources can be used without crossing fuels. But, if you can get a proper balance of lean protein and healthy carbs without the use of fat, E meals are life changing, especially if you’re a Mom, pregnant, and otherwise feeling run down and tired! E meals give you energy! 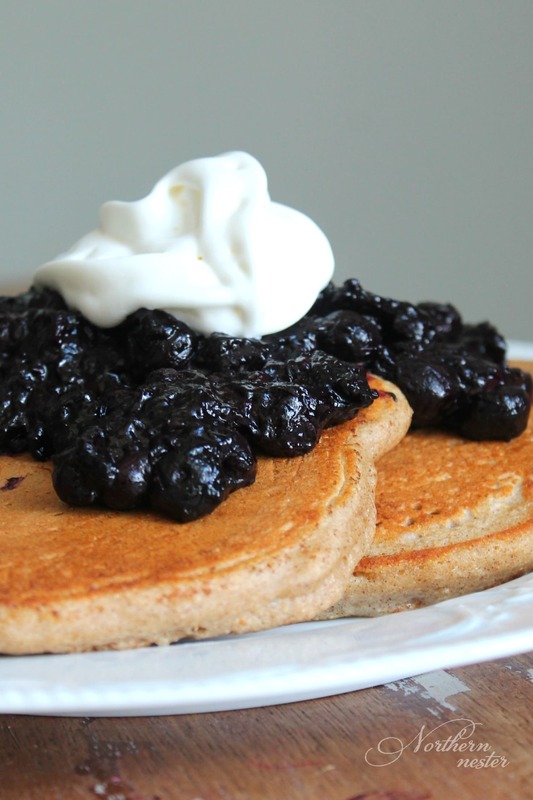 To be sure I felt full, I put 3 of these fluffy pancakes on my plate after I made them, topped them with a wonderful blueberry compote (recipe below), and a little low-fat whipped cream. Wouldn’t you know it, I could only eat one, and my hubby ran into the same problem! There’s so much protein in these Cinnamon Protein Pancakes from the collagen, egg whites, and fat free Greek yogurt, that we were stuffed after one pancake! You should be able to get 5-6 pancakes out of this recipe, so you’ll easily be able to serve 3-4 people….even 5, if you find them as filling as we did! 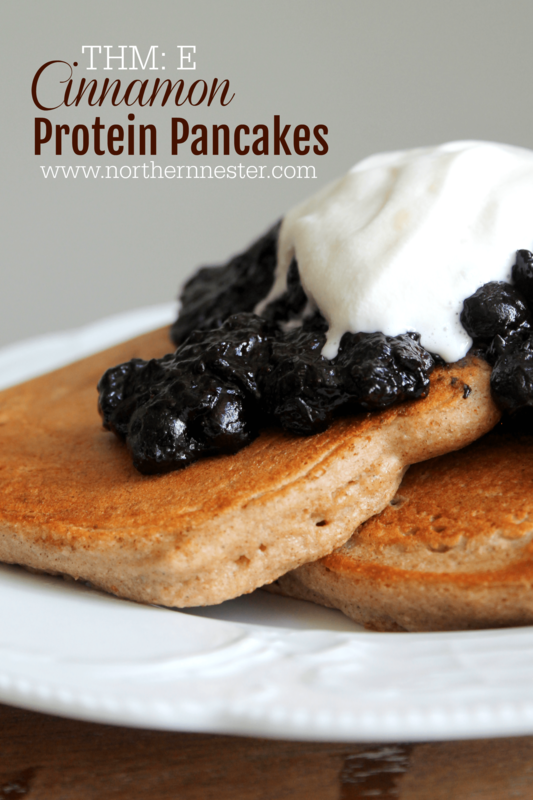 Alternatively, you can freezer these Cinnamon Protein Pancakes and warm them up in a toaster oven or microwave as needed! A great prep ahead E breakfast! We love these Cinnamon Protein Pancakes with a fruit compote. I’ve included the recipe for a blueberry compote here, but you could use almost any fruit, or a mix of them, fresh or frozen, since this is an E meal anyway! Berries, peaches, pears, apples…anything goes. Or, douse these pancakes in a sugar-free maple syrup if that’s your thing. Nature’s Hollow is plan-approved. Did you know you can make fluffy pancakes with collagen?! I discovered this somewhat by accident when experimenting with these Cinnamon Protein Pancakes, and I love how they turned out! A THM E.
In a bowl, mix oat flour, collagen, baking powder, and cinnamon until fully blended. Add egg whites and Greek yogurt to the bowl and beat until batter-like consistency is reached. Melt butter or coconut oil in a non-stick frying pan over medium-high heat. Pour in batter by 1/4 cup-fulls and cook pancakes until bubbles form all around the top of the pancake, then flip and cook for a few more minutes, or until cooked through. To make the blueberry compote, bring blueberries, lemon juice, and optional sweetener to a boil in a saucepan. Remove from heat and whisk in xanthum gum until thickened. Pour over pancakes and enjoy! Optional: garnish with Fat-free Reddi Whip. Looking for more yummy, on-plan pancakes?! Try these on for size! Yum! So good. So fluffy! I’m eating these this morning for breakfast with the fruit jam from the THT cookbook. Thanks for your yummy recipes! Could I use cottage cheese instead of yogurt? I have all the other ingredients. Can’t wait to try these! Hello. I am enjoying looking at all of your recipes. My question is – I have a sensitivity to eggs. So many of the recipes have a lot of eggs or egg whites in them. Do you think I can make some of the eggs with flax eggs? When it calls for egg whites I wonder how that would work? Thanks so much!